Corsica stacking rings shown with my wedding band. The February 2012 issue of Lucky features a section I always like called “The Look I Want Now!” where one of the fashion editors talks about the clothes and accessories she’s craving. 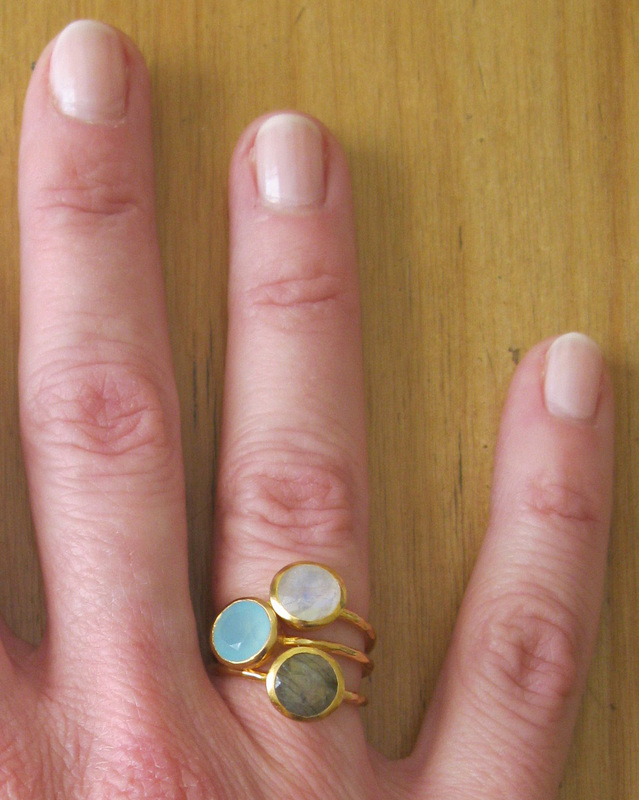 I adored the three rings from Julie Collection called “Corsica” rings in chalcedony, labradorite (iridescent gray) and moonstone, and when I saw that readers could take 35% off the price of each ring, $48 regularly, now $31.20, until February 27 or while supplies last, it was a done deal. Julie Collection is in Manhattan off Lexington Avenue on 74th Street (my old stomping grounds since my obstetrician’s offices are around the corner) so I packed up my daughter (a very patient child) and we made a trip to the city. The studio is well-lit, the sales associate Aimee gorgeous and charming (and one of the models on the website, look for the lovely girl with long light brown hair and dimples! ), and there is so much to love in this collection that I predict a few more rings and bangles will find their way into my jewelry box. Chalcedony, the most hypnotizing shade of blue. What I especially love about these rings is how they look ancient and modern all at once, like something I lifted from one of the Egyptian cases at the Brooklyn Museum. If someone asks me about them I think I’ll say, “These old things? I picked them up the summer I worked at an archaeology dig in Italy.” They look fantastic together as a set and even more amazing when worn with a simple gold band. I’m wearing and loving them now and they are going to be a key part of my look this summer. Labradorite, which does all kinds of pretty green-gold things in the light. Aimee wrapped my rings into this hot pink pouch. Mama like! Moonstone, which is white one minute, purple and blue the next. I don’t know what I was thinking, but I didn’t buy this when I visited the studio. I regretted that decision so I snapped it up online the next day and it arrived the day after that in the pouch shown below. I have been on the hunt for a big ring for my right hand for some time, but I didn’t want gaudy or even too sparkly since I was interested in something for everyday use. These Corsica rings beautifully fit the bill. With my wedding band. I love them both ways! These are fabulous--and the price is incredible. The style is exactly what I saw in the hippest AND in the most lovely boutiques in Paris, but often those prices were outrageous. You made a great choice in getting all of these. They are gorgeous, Jill. I can see why you like them and how beautiful they look with your wedding band. You always find such beautiful things, my dear Jill. I never wear wedding band. Very pretty rings on such a pretty hand. I can't believe that price! They look great stacked on top of your wedding band. I saw those in lucky--they look even better on you! Well, we definitely have the same taste! I have been wanting to order pretty much the same rings off a seller on Etsy! I think I may just have to splurge and buy them now that I see how fabulous they look stacked up on your finger! These are gorgeous and they are so rich-looking. What a great find. Enjoy them!! I see, I am starting my NY list today. Those rings are beautiful. They remind me of the rings Lisa Eldridge wears, they are an eyecatcher. After reading what you have paid, I can not spend 1800$ on a single Pomellato "nudo"-ring (they are meant to be worn as "stacks" like yours. The combination with the wedding ring is a nice one! Maybe you sould return with your daughter next year, and the year after, so she won't forget those trips. Oh, the chalcedony and the moonstone, they are especially beautiful - I'm green with envy!